Driven by a passion for electrical engineering and health care, UW electrical engineering Ph.D. student Rahil Jain joined Associate Professor Barry Lutz’s lab to advance disease diagnostics technologies. He investigates ways smartphones can enhance the control, detection and interpretation of diagnostic tests. To satisfy his entrepreneurial drive outside the lab, he works to develop “smart home” consumer electronics. Dr. Lutz and Rahil were the first to demonstrate how audio frequency can drive fluid in microfluidic devices in different directions. Their findings were featured on the cover of Lab on a Chip March 24. 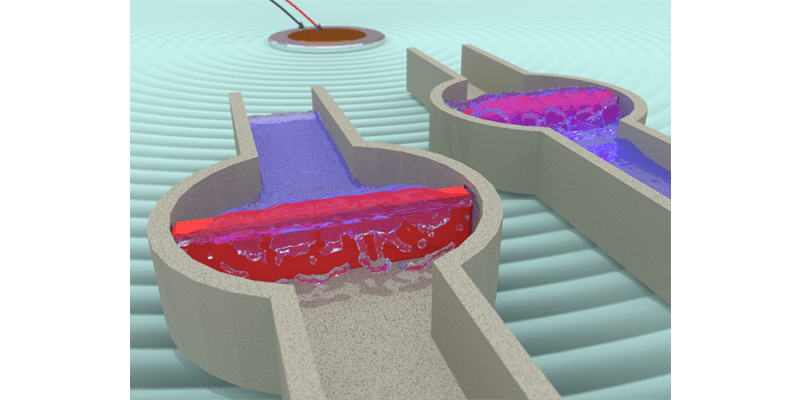 This research opens doors on new ways flow in microfluidic devices can be controlled with cell phone audio. 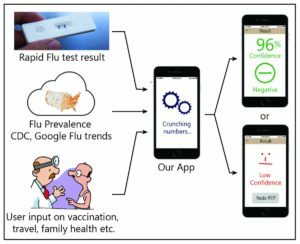 Rahil is also investigating ways to increase the accuracy of tests for the flu and other diseases by using a smartphone app that analyzes risk factors. For his work developing the app SmartDX, he was selected as a finalist for Massachusetts General Hospital’s APF Student Technology Prize and received the a finalist for Massachusetts General Hospital’s APF Student Technology Prize in and received the third place prize at the inaugural GIX Innovation Competition in Beijing, China in 2016. In 2015, Rahil led a team to win the 2nd runner-up and the Best Consumer Product prizes at the UW Business Plan Competition (BPC) with Hook, an affordable home automation hub that connects household devices to the Internet and enables their operation via a smartphone. This year, he is headed to the finals of the UW BPC with Airy, the world’s first wireless home security system that works without batteries. With Airy, Rahil seeks to reduce the environmental impact of the billions of batteries that end up in landfills worldwide. 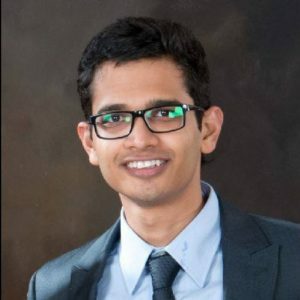 We recently spoke with Rahil to learn more about his research, how he discovered BioE as an electrical engineering student and his motivation to create smart solutions for improving health care. Tell us about your Lab on a Chip cover article. What were your findings, and what are the applications of this work? We’ve been working on technology to control flow in microfluidic devices used in disease testing. Our goal is to control these devices with ubiquitous instruments like cell phones, because people usually have them, even in low resource settings. We previously demonstrated that smartphone audio capabilities can be used to perform sequential delivery of reagents – the most essential aspect of a diagnostic test. This device will have multiple channels that merge into a common reaction chamber: one with the sample, one with reagents and another with a buffer. For the test’s chemistry to work to produce a result, you would want to introduce these in a systematic and timely way. By changing the smartphone’s audio frequency, each of these channels can be activated and the corresponding fluid can move to the reaction chamber. 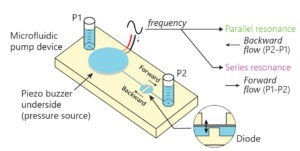 Rahil’s frequency-controlled, bi-directional, microfluidic pump could be used to automate flow control and improve performance of microfluidic diagnostic tests. During this work, I stumbled upon something astonishing. Not only can you turn the flow on or off by changing the frequency, but you can also change the direction of the flow. This finding led to development of a bi-directional pump, and we can use these pumps to create highly concentrated reaction mixes by moving fluids back and forth over the pre-dried reagents. Rich solutions could increase the sensitivity and performance of a diagnostic device. Our frequency-controlled bi-directional pump was groundbreaking. Nobody has demonstrated this before, which is why we were selected for the front cover. How does this work connect to your Ph.D. project? My thesis is titled “Smartphones for control, detection and interpretation of diagnostic tests.” Diagnostic tests require a way to control the test, chemistry to perform the reactions and a way to detect its results. Controlling the test and detecting its results with a smartphone are where my research comes in. SmartDX integrates information from rapid flu tests, infection trends and personal health factors to calculate the confidence of a positive or negative flu diagnosis. Where does SmartDX fit into your research? With diagnostics detection right now, you just read whether there is a line or not on your test strip. This is really basic, pretty dumb really. We want to make these “smart” via a smartphone app that uses additional information from internet sources such as CDC databases (FluView) to help us interpret it. Our primary target for the test is influenza, because existing tests are only 50 to 60 percent accurate. For example, we could look at the result along with whether the disease is prevalent in the community, or whether you got your flu shot that year, or if you have sick kids at home. All these are risk factors for a positive result. Our preliminary results suggest that we can increase a test’s sensitivity by 15 to 20 percent. While this is significant, we anticipate even better performance by integrating regional prevalence data, which is the biggest risk factor. For the initial work, we were only looking at factors like having a sick family member at home. We’re currently working with data from UWMC to do a more thorough study with prevalence data. Where could we see this work in the future? We’re working to identify clinical settings where augmented testing could add value, such as in pharmacies where a doctor isn’t usually available, and pursuing commercialization grants. We think that developed countries, such as the U.S. and in Europe, where a lot of data is available and routinely collected, is the first target for this work. Here, improved diagnostics could reduce costs, increase efficiency and reduce the overall health care burden on the community. Since we are a global health focused lab, we’re also exploring opportunities for this work in developing countries. Outside the developed world, our disease targets would be a little different. Heath care workers do not collect infection data routinely, but we can use satellite imagery and weather services information. For example, following rains in the Amazon rainforests, you will see a spike in malaria. If you give a test now, and last week’s storm caused puddles to form and resulted in more mosquitoes, we can expect a positive test is more likely to be positive. As an EE student, how did you decide to pursue research in a BioE lab? I have bachelor’s and master’s degrees in electrical engineering, so when I applied to UW, I chose the EE program because it was a good fit. During my master’s at Duke University, I got interested in health care. I worked with their department of pulmonary medicine to do statistical modeling to identify risk factors for lung transplant rejection. When I came to EE at UW, there weren’t many labs working on health care applications. BioE was at the top of my list, and Dr. Lutz had an opening for a graduate student for this specific project. Microfluidic devices can be modeled as electrical circuits, and as an EE guy, I know how to make good circuits. Dr. Lutz realized that I could translate this knowledge to help advance the research, and was happy for someone to bring a different perspective to the project. It was a really good fit, it had health care applications and an EE flavor. What about your work excites or motivates you? What excites me about SmartDX is that it’s so rapidly applicable – it’s software. I have developed hardware and devices, but software is so much easier and faster to deploy, test, change and update. It has that quick gratification that physical devices lack. I’m really excited to have this opportunity to develop software to help the health care system, and to see something I’ve been out in the market being used. How did you decide to work beyond your research, and develop Hook and Airy? One of the things that gets me out of bed every day is to see someone using something that I created. My research is exciting, but far from getting out to the market. That’s the nature of health care; devices must go through regulatory processes and testing. I wanted to use my skill set to get something out to the market quickly. Right now, Hook and Airy are the two products from my company, Hack-a-Joe Labs, and I will probably be working 50 to 100 percent of my time on them after I graduate. We’re in full-on innovation mode, and we continue to find new applications. Hook got started when I needed a budget smart home system for my apartment. There was nothing out there, so I created Hook based on my needs, and found that a lot of people wanted something like this. Airy got started when I discovered these generators that could replace batteries in smart home systems. They generate power when they’re pushed, and create an electric pulse when they are pushed back. I made an electrical circuit that attaches to the generator that has a wireless transmitter that can send a signal to your cell phone when a window or door has been opened. Why would you recommend BioE to prospective students? BioE is so engineering driven, but also has tangible health care applications. I think if you are interested in engineering, and in making a difference in peoples’ lives or in health, BioE is a good fit. The problems we are solving require all kinds of experience. In diagnostics, we need physics, instrumentation, mechanical and electrical engineering. If you have those skill sets, you are bound to make a big difference here.